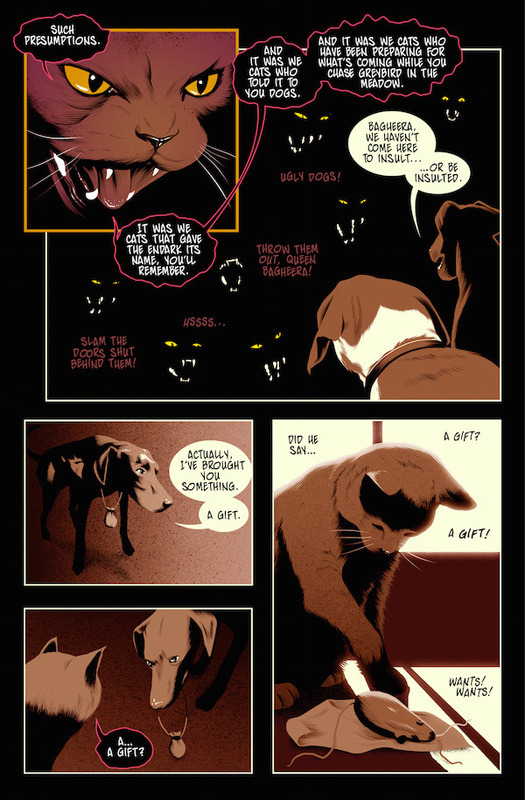 The creators of these thought-provoking comic books talk about introducing a clan of cats to dogs navigating a post-apocalyptic future. The only survivors in a post-apocalyptic world, it has been said, will be cockroaches scurrying around amid the debris and chaos. 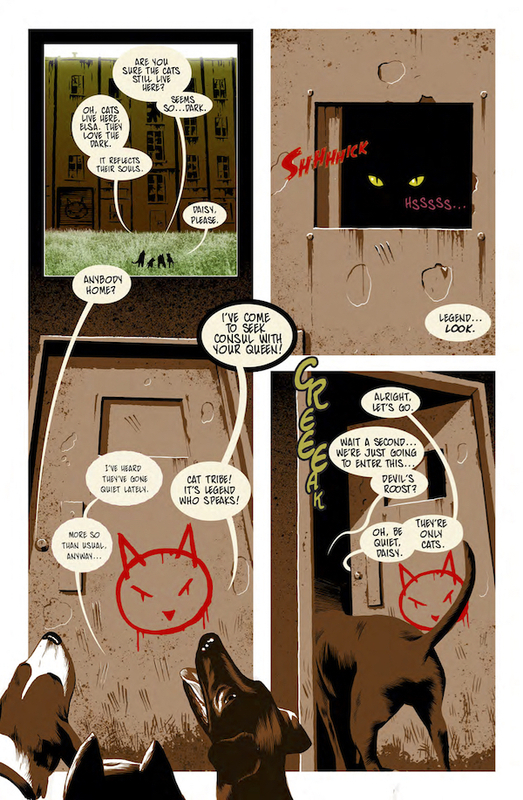 That’s not entirely true in Legend, a new comic book that stars cats and dogs trying to get by in a blighted realm and figure out just what the hell happened. The following four comic book panels can be read sequentially as an excerpt from the Legend story. When writing Legend, did you always intend to include dogs and cats in the story? 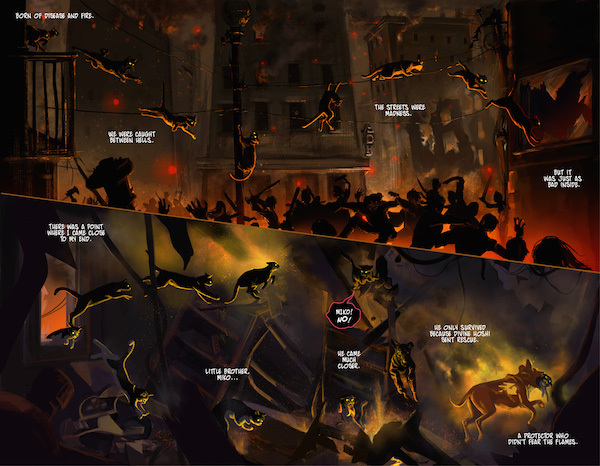 Sam Sattin: The first image I had for Legend was of a clan of dogs mourning their fallen leader in a dark urban atmosphere, so I’m not sure if I could say that cats were a factor at that time. 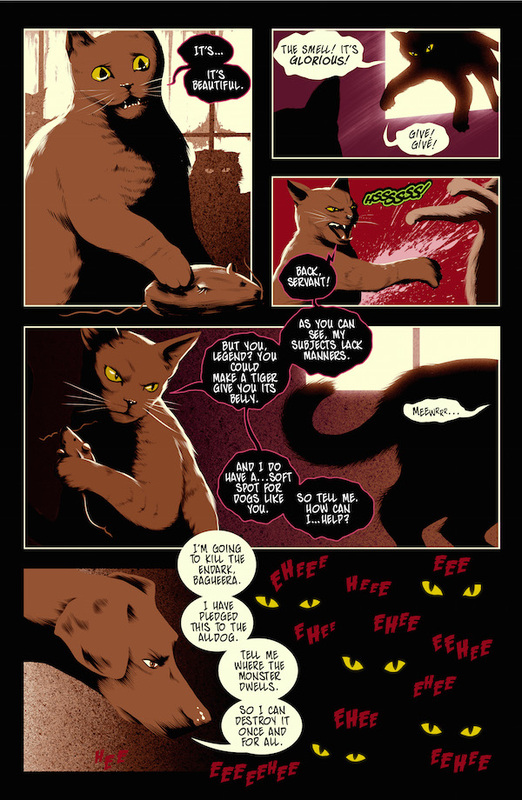 But the moment the story started to grow from an idea into something more substantial, felines dropped hard on the scene. Gotta love that cat armor. How are the cats’ emotions and worldview different from that of the dogs? Sam Sattin: I grew up a cat owner. Though we owned dogs too, my family at one point possessed five cats, all of which quickly became outdoor felines. We lived near a reservoir and national park in Colorado, and our cats had a vast open world to explore. I started to notice a lot of differences between cats and dogs then. Our Golden Retriever, Mugsy, for instance, needed a leash to go outside, like most dogs. He was headstrong, and his love and loyalty were fierce, but he always required a certain amount of attention that our cats would have scoffed at. My Siamese cat, Miko, was a smart, savvy hunter who often perched in the 50-foot Douglas Fir in our backyard, searching for birds. He belonged to no one but himself, was a nocturnal prowler, and was sometimes mistaken for a wild animal stalking about our neighborhood. But then Miko would come inside and snuggle up in my lap at night and follow me downstairs every morning when I woke. So my experience with dogs and cats throughout my life has informed how the tribes in Legend are constructed. The dogs worship a selfless god, while the cats worship a far more cautious and distrustful one. Each species essentially wants the same thing: safety and care. But they have very different ways of attaining them. And it’s because of those differences that they end up at each other’s throats. This also plays out in the politics of each tribe. The Dog Tribe is a little more democratic in its leanings, forming somewhat of an oligarchy, while the cats are more dictatorial, with a monarch at their head. Beware of canines bearing gifts. Bagheera is the cats’ leader. How would you describe her personality? Sam Sattin: Everyone owes Bagheera a favor. She’s a character for whom leverage is a central tenet of survival, and she knows a little too much about the world and its perils to risk losing an ounce of power to unruly subjects or outside threats. She always strikes first, and is thus regarded by the Dog Tribe as cynical and sinister — though I personally like to think of her as a pragmatist. Is her name an homage to the Jungle Book character? Sam Sattin: The name is somewhat of an homage to Bagheera in The Jungle Book. He was Mowgli’s ward and knows the ins and outs of the entire jungle. He’s wise, caring, intelligent, and enjoys balance, although unlike the Bagheera in Legend, he’s not enamored with power and control. The Bagheera of Legend wouldn’t have been a good caretaker for Mowgli at all. Bagheera and her cat clan. 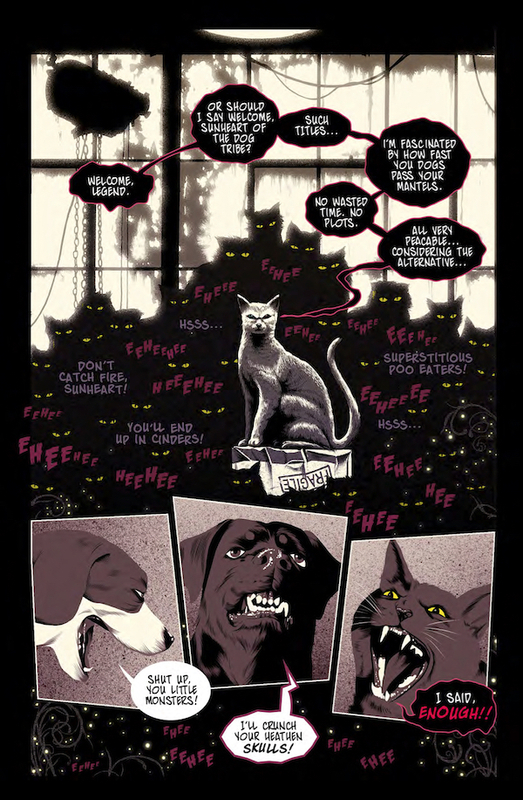 A bunch of insults are directed at the dogs in the second issue, such as cats calling them “tail chaser,” “mud sniffer,” and “superstitious poo eaters.” What’s your favorite one? Sam Sattin: It’s actually one that the dogs call the cats: nightcrawler. 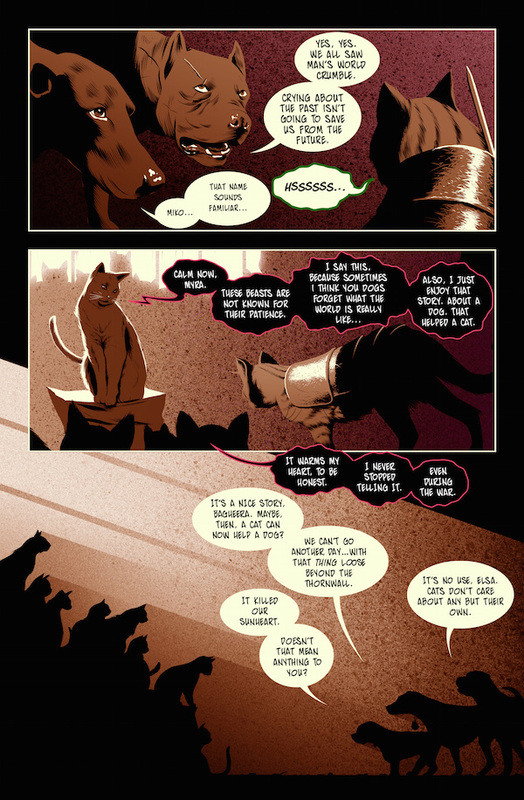 When the dog Daisy calls one of the cats that in issue two, she intends it as an insult, but the cats actually take it as somewhat of a compliment instead. Insults themselves are something that cats excel at. They know how to pour salt on wounds, while dogs only know how to lick them. Behold the ancient illuminati cat graffiti logo. Possibly. In the first issue, the illustrations are colored and presented from a dog’s eye view of the world. What approach did you take for those scenes from the cats’ point of view? Chris Koehler: The art has a limited palette that conveys mood and theme, as opposed to accuracy in representation, which is true for dogs and cats. When the world is seen through a dog’s point of view, the colors are more saturated and moodier; objects are distorted slightly, and the mood is amplified. The dogs see the world more optimistically and with more wonder. They see the world through the lens of their emotions. The cats are more cynical and grounded. Through their eyes, the world is more desaturated. The colors are colder and less natural. Scenes are more angular and the panels are framed closer and more direct. Cats see the world more analytically, more pessimistically, and are more ordered and hierarchical. The cover of issue two. Don’t worry, there are more cats inside it. 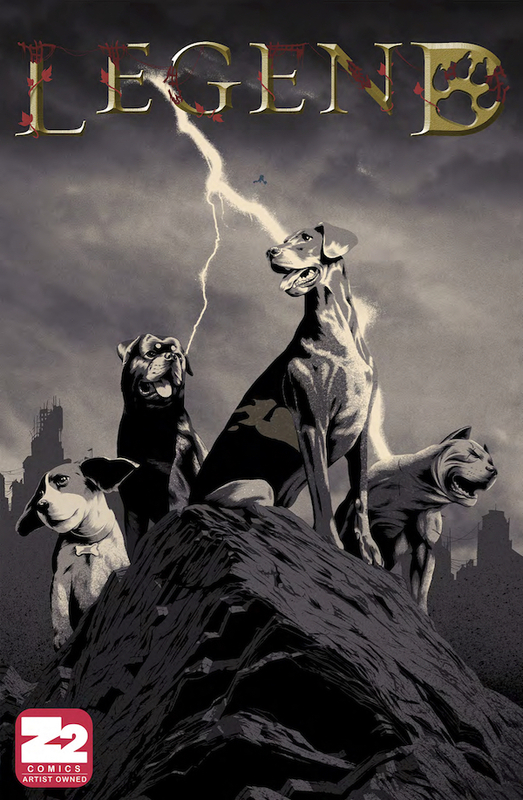 Finally, in a real life post-apocalyptic situation, who’d fare better, cats or dogs? Sam Sattin: Down to the nitty gritty, eh? That’s a really tough question to answer, but a fascinating one. I think that dogs are more unified in a lot of ways. They’re the ancestors of wolves, run in packs, are strong, lean, and built for survival. Cats aren’t as large, but their tendency to stalk, to conceal, to be patient and cunning, allows them to outwit (and outwait) the strong. I think that dogs would fare better in the short term, perhaps, but cats might fare better in the long term. I prefer the option that, through working together, cats and dogs can help each other survive longer than they would independently. Maybe that way they could even help restore some order to a broken world. Issue one of Legend is available now (published via Z2 Comics). Issue two is scheduled to be out on comiXology next week, and in stores June 22.